Vita Cura® 5 Phase Firming Facial with Micropeel is based on Repêchage’s exclusive combination of natural marine and herbal ingredients to invigorate, lift and firm mature skin, providing advanced skin repair. The treatment provides an instant trigger to young looking skin. Long term benefits to preserve elasticity, improve oxygenation and help prompt cell renewal. By understanding the science behind natural therapies, Repêchage is able to provide the most advanced skin solutions for today’s client. Plastic Surgeon Recommended. Together, these 5 phases provide unsurpassed anti-aging results. Phase 1: Vita Cura® Enzymatic Micropeel: This papaya-based peel gently reveals brighter, younger looking skin and a vibrant complexion. Phase 2: Vita Cura® Cell Renewal Serum: This serum is massaged into skin to promote cellular repair, improve circulation, decrease dryness, and provide protection from oxidative damage. Phase 3: Vita Cura® Triple Firming Treatment Cream: This phase firms the skin in three dramatic ways. Messenger Pentapeptides acts faster than Retinol, without the redness and irritation, Marine Biopeptides stimulate collagen production and cell renewal, and Red Clover Extract provides a hormonal trigger to younger looking skin. 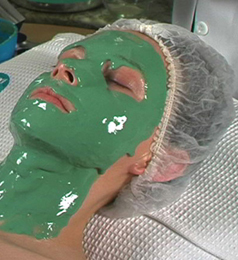 The Triple Firming Treatment cream is applied using the Lydia Sarfati Classic Facial Massage Technique. Phase 4: Vita Cura® Firming Mask: Spirulina and Laminaria Digitata Seaweeds firm and smooth the skin while enhancing the action of previous layers. Phase 5: Vita Cura® Opti-Lift Serum: A Biopolymer of Almond protein provides immediate and visible lifting properties that you can see and feel.